Have you guys been watching The Comedians on FX? Starring Billy Crystal (no introduction needed) and Josh Gad (the original Elder Cunningham in Book of Mormon & voice of Frozen's Olaf) it's the newest addition to our already crowded TV arsenal. We kept seeing commercials for it during Justified and knew this was a show we had to see. It's a mockumentary-style 30 minute comedy that follows Billy and Josh as they begrudgingly prepare to share the spotlight in a new comedy sketch show on FX. It's smart, it's funny. 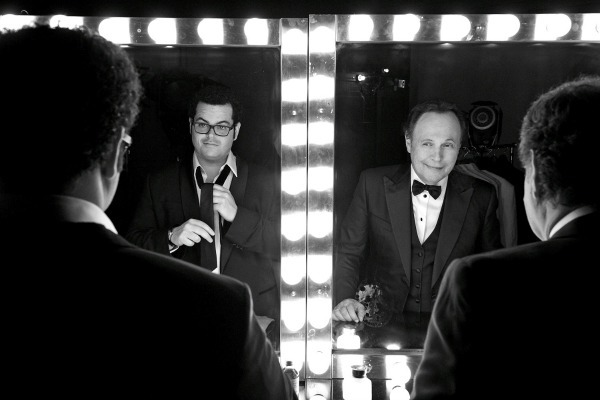 It has me loving Billy Crystal more than ever (because it's refreshingly clear that he doesn't take himself very seriously) and admittedly kind of crushing on Josh Gad for his subtle, narcissistic humor and his continued homage to himself as the original star in Book of Mormon. It's a great blend of the ridiculousness that is Hollywood and the unlikely and forced friendship and camaraderie of a comedic legend and a relative newcomer who is in serious denial of his celeb status. If you enjoy shows such as Arrested Development, Louie, It's Always Sunny in Philadelphia (aka smart humor) then you need to check this show out!